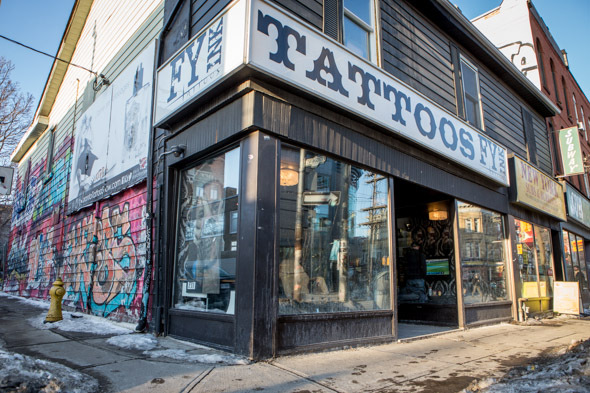 FY Ink Tattoos is a street-level Queen West tattoo shop in a prime spot for walk-in traffic, which hits a fever pitch during the summer months. Unfortunately, it's a freezing cold day in Toronto - probably the coldest day of the year. I'm in the heart of Toronto's sleek fashion district, but all I can think of is wool sweaters, Gore-tex gloves, and a puffy coat. The weather outside is frightful but I'm determined not to let it cool my spirits. I'm here to talk tattoos with Forever Young 's affable shop manager, Andrew Carasco. "Nobody wants to walk around in this kinda stuff," Carasco says as we make small talk about the cold snap. "Come summertime, this place is crazy. 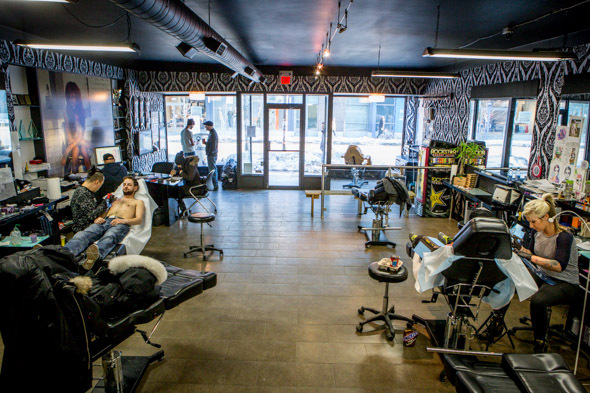 You can't get a seat on the bench to wait for your tattoo. People are hanging out in front of the shop. I think it's that vibe that makes the place busy." Even first thing in the morning, the currently empty space conveys a huge personality. The shop's senior artist, Scoot is prepping for his day. He's a bundle of energy, cracking jokes to all within earshot. It's not hard to see why he's done spots on Spice TV's tattoo show, I Hate My Tattoo . The man is ready for prime time. And that's not just because he's got that elusive "thing" that reality TV producers love. He's a solid artist with an ever-growing reputation. Known as a go-to for celebrities, Scoot's work adorns the skin of Johnny Depp, Chris Bosh and Bam Margera. 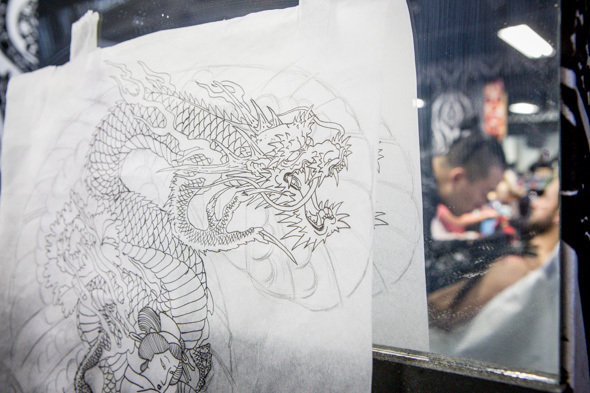 "Basically any celebrity that comes through town is getting tattooed by him," explains Carasco. "It's just networking. They kind of all hear about him." 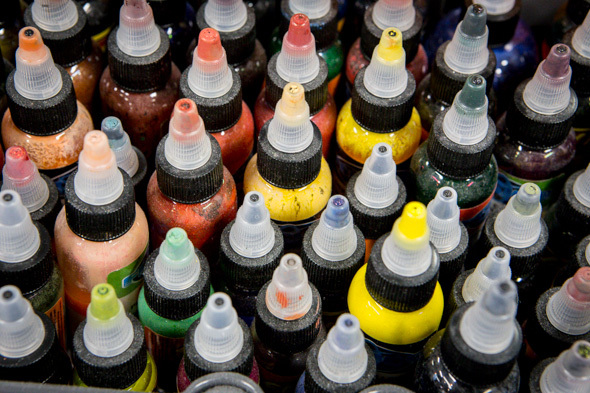 But certainly FY Ink was not a story of overnight success. With humble beginnings in the Yonge/Davenport area, shop owner Lee Baxter recognized that the foot traffic wasn't ideal, seldom extending past 5 pm. 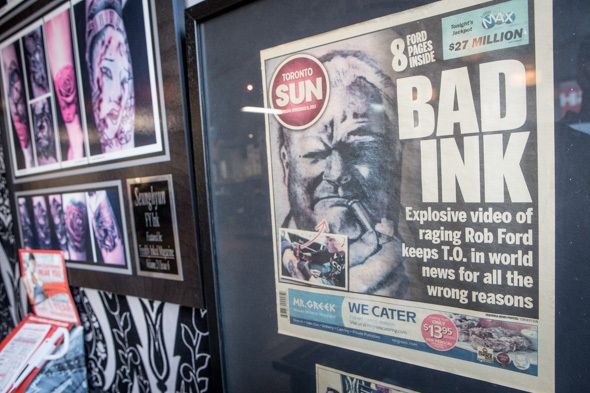 A move to Queen and Bathurst proved the recipe for success. "There's always people walking around at all hours," says Carasco. "Everyone wears tattoos here vs. the Rosedale area. Walk-in traffic has definitely increased." But seemingly, so has the competition. 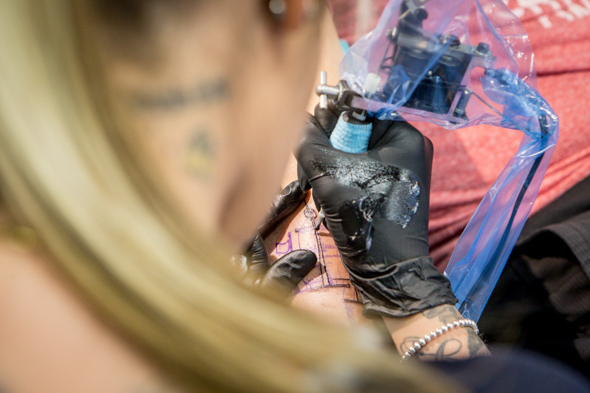 With several other shops within walking distance (notably TCB Tattoo Parlour , Abstract Arts, and New Tribe Tattoo ) the Queen West strip is a hotbed for tattooing. "I don't really notice anything big in terms of competition," says Carasco. "It's because the people that are coming here are looking for something specific." That something specific is portrait-style work, with four artists that specialize in photorealism. "Used to be you couldn't find the quality of portrait that you find here unless you traveled. With the level of artistry and the awards that they've won, this is the portrait-style shop to come to." FY Ink knows what they've built their reputation on and are proud of their recognition as a premier portrait shop. "It definitely wasn't planned but its what we've come to be known for," explains Carasco. "I think it's important to be recognized for something special within your scene." Not that they are a one-trick pony (they have artists that do everything from American Traditional to West Coast script styles) but as a customer-service oriented shop they just want to make sure that any potential customers get exactly what they're looking for. In doing so they show an incredible amount of respect to the Toronto scene in general. "I think that one of the biggest things you can do for this industry is that if you can't do something, send the customer some place that can," Carasco says. "When it comes to Asian style, yeah we can do that but why not go see Chronic Ink who specializes in it and has won multiple awards for it? If you're going to get a tattoo, sit with the best."